Home laboratory CBC or Blood CP – Interpretation of the results. CBC (complete blood count) or Blood CP (blood complete picture), Known by other names as FBC ( Full Blood Count ), is the most common blood test performed in hospitals, clinics or any other healthcare centers. Though solely Blood CBC test would never be enough to make a diagnosis, it still is extremely helpful in diagnosing a number of diseases. There are more than 20 components measured in this test but here we will discuss the most important ones only. Blood is taken from an easily accessible vein in a syringe and is shifted into a specific bottle known as Blood CBC bottle that is usually capped with a purple plastic and rubber. Some Blood CBC bottles are pre-fitted with a needle and blood from the vein would directly flow into the bottle. It contains a small amount of EDTA (EthyleneDiamineTetraAcetic acid) that can be seen at the bottom of the bottle, which acts as a potent anticoagulant. It is important to move the bottle upside down and then back up a few times in order for the EDTA to mix with the blood so that it would not make a clot inside. Blood from the bottle is poured into a machine called “Hematology analyzer”. In a few minutes after analyzing the blood, the machine automatically prints a small paper with all the values on it. What actually happens in the machine is blood is allowed to pass through very thin tubes through which laser light is transmitted from one side. Reflection on the other side of the tubes is detected by a computer. So the numbers that we get on the paper from analyzer are actually from the data fitted into the computer i.e. if a very small oval cell with no nucleus is detected, it is counted as a platelet. 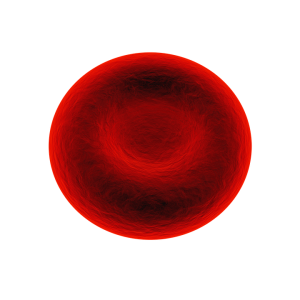 A large cell with a nucleus is detected as a White Blood Cell and the same way Red blood cells are counted. The laser light is also programmed to detect pigments (as in hemoglobin) and thus we get the value for hemoglobin. Some values are merely calculations done by the computer and printed on the paper. Now that we know the mechanism through which the analyzer works, it is of importance to notice that sometimes immature Red Blood Cells ( Reticulocytes ), which are large and have a nucleus, are detected as white blood cells and we would get a false raised White Blood Cell count. Small Red Blood Cells would be identified as platelets by the analyzer. WBC count is decreased whenever there is a problem in its production. WBCs are made in the bone marrow. It is always necessary to do further workup if WBC count is low because low WBC count would render the body prone to infections. Low WBCs in a CBC report = Low Immunity. The most abundant type of WBCs in the circulation. It constitutes about 50-70% of the WBCs. 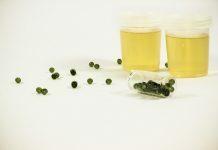 It is mainly increased in acute bacterial and fungal infections. Stress and steroid use also increase neutrophils. Pus contains dead and dying neutrophils. T-Cells: 3/4th of the circulating lymphocytes are T-Lymphocytes. These are further divided into CD4 T-Cells ( 2/3rd of T-Cells ) and CD8 T-cells ( 1/3rd of T-Cells ). Human Immune Deficiency Virus (HIV) destroys CD4 type T-Cells and the count is decreased. Natural Killer Cells: <10% of Lymphocytes are NK cells. Lymphocytes are usually increased in viral infections and Leukemias. Subtypes of lymphocytes are not detected by the hematology analyzer. Special machines are required for testing T cells differential counts. The largest of White Blood Cells. Constitutes around 5-6% of circulating WBCs. They actually become Macrophages which are helpful in clearing chronic infections and infectious debris. About 2-4% of circulating WBCs are eosinophils. They help in fighting parasitic infections and are predominantly increased in allergic reactions. <1% of circulating WBCs, Basophils also play a role in allergic reactions. Given in the laboratory report as 4.5-6.0 million / microliter (mil/ul) of blood which is the value in a normal Blood CP. We are talking about millions, which means RBCs are the most abundant cells in the circulation. What they do is taking Oxygen from the lungs into the different parts of the body and in return takes Carbon Dioxide out of body tissues to the lungs. RBCs are normally increased in conditions like Chronic Lung Diseases, Congenital Heart Diseases and in people living at high altitudes. The increase Red Cells count in these conditions is merely due to the compensation of the body to produce more red cells as there is less oxygen supplied to the tissues. The pathological Condition in which Red Blood Cells are increased is known as Polycythemia Vera. Normal Hematocrit value in a blood CP report: 40-48%. It is the percentage of red blood cells in whole blood. It is calculated when whole blood is put in a test tube and allowed to centrifuge. A centrifuge is a machine that spins the test tube at a very high speed which allows the heavier components of whole blood to settle down. As red blood cells are heavy, it would settle down at the bottom of the test tube followed by platelets and white blood cells, leaving plasma in the uppermost portion of the test tube. After that calculation of HCT is very easy. The percentage of the amount of space occupied by red cells at the bottom of the test tube is HCT. These days the hematology analyzer can directly measure HCT without the need for centrifugation. Reasons for high and low HCT is similar to that of RBCs. It is obvious as HCT would be directly proportional to the RBC count. The more the RBCs the higher the HCT would be and vice versa. Its value in Blood CP is represented as 12-16 grams / deciliter (g/dL). RBCs are basically sacs filled with hemoglobin. Hemoglobin is the actual component of RBCs that carries Oxygen. HB value represents the amount (mass, weight) of HB in a given volume of WHOLE BLOOD. RBC count, HCT and HBG are very closely related. There is no reason for one of these to rise and the other one to fall. So the causes of the increase/decrease of these three are similar. An exception to this rule is pseudo-polycythemia which occurs in states of dehydration. Since there is water depletion, plasma in the blood decreases, the hematocrit increases despite no change in the RBCs count. This value is given as 80-100 femtoliter (fL). MCV means the average volume of the red blood cells. Conventionally speaking that would mean taking the individual volume of each cell measured by the number of cells. The average value that we get is the Mean Corpuscular Volume. Reticulocytosis (As discussed earlier also, Reticulocytes ( Immature Red Blood Cells) are nucleated, unlike mature RBCs which lack a nucleus. And for that reason they are large and would raise the value of MCV). Therefore any disease process which would increase the production of RBCs (as in hemolytic anemias) will lead to leakage of immature RBCs into the circulation and that would ultimately lead to increase MCV. Measured in picograms (pg). The normal range is 27-32pg. It means the average amount of HB in each cell. It is simply calculated by the total amount of hemoglobin in one unit of blood divided by the number of RBCs present in that one unit. HCT = HB / RBC count. It is measured in picogram which is a very tiny value (1 trillionth of a gram). MCHC means the amount (mass, weight) of hemoglobin in a given volume of RBCs. Note that this is different than HB where we mentioned the amount in relation to the WHOLE BLOOD. Here the weight of HB is taken in relation to HCT, which are only Red Blood Cells and not the whole blood that contains plasma, other cells and other contents of the blood. Causes for increase and decrease are much similar to that of MCH. So let’s not talk about it again. The cell size of spherocytes is smaller so MCV is Decreased but sometimes normal because of the fact that due to hemolysis in HS more production of new RBCs will lead to increased reticulocytes in the bloodstream which will bring the MCV value close to or in the normal ranges. MCH is usually decreased but can be normal also. Read MCHC. MCHC is usually increased in Hereditary Spherocytosis because the membrane of spherocytes is very thin and fragile. Which leads to leakage of water from the cell. 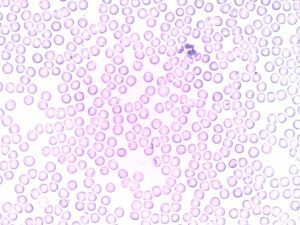 Shrunken Red Blood Cells means low HCT. Now as mentioned earlier, HB is decreased in Hereditary Spherocytosis but the proportion at which HCT is decreased is far more significant, hence increased MCHC. Sickle cell anemia can sometimes also give us the same values for the same mechanism. Reported in two different ways which diagnostically are the same thing but calculated in a different way. It actually is the measurement of variation in RBC sizes. What the hematology analyzer does is measure millions of red blood cells. Some of which would be small and some large. RDW is the measurement of this variation in different sizes of RBCs. If there are 3 RBCs measuring 80, 90 and 100. The analyzer would measure the MCV by taking the mean of all sizes which here would be 90. The variation would be 20 as the difference between the smaller and larger cell is 20. This 20 degree of variation is called RDW. So, a big value would tell us that there is a lot of variation and vice versa. Decreased RDW rarely occurs and is not of any diagnostic significance. Given as 150,000-450,000/ microliter (ul). Platelets also are known as “Thrombocytes” helps in Hemostasis, which is stopping blood loss after an injury. They are the first ones to form a clot by adhering to each other after an injury to the vessels. Clotting factors come on later to stabilize that clot. Acute blood loss, 1/3rd of the total platelets are normally stored in the spleen. In acute blood, loss spleen will release the stored platelets into the circulation that will increase the platelets count. 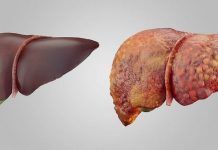 HELLP syndrome (Hemolysis, Elevated Liver Enzymes, Low platelets) – occurs in pregnancy. Basically the same as MCV only instead of RBCs here it is Platelets. Usually increased in THROMBOCYTOSIS where production is increased. Decreased in THROMBOCYTOPENIA where production is decreased. The idea is increased production will lead to bigger platelets and vice versa. NOTE: The normal values for Blood CP that I have mentioned here vary from lab to lab. So a little bit different is not noticed. Significant high or low value is what to be worried about. Previous articleJaundice or icterus is a symptom and not a disease! !